Get a free Corona Equine Ointment sample. 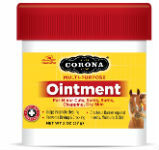 Corona Ointment is a first aid treatment for horses and other animals. Fill out the form to get a free sample.